Want some thrills and chills? Just ask 2015 King of the Hill, Jeremiah Root and Stacy Allen what it’s like. The Fat Tire Classic Mountain Bike Race offers all the thrills you can take plus a kids’ race supervised by the CHP. 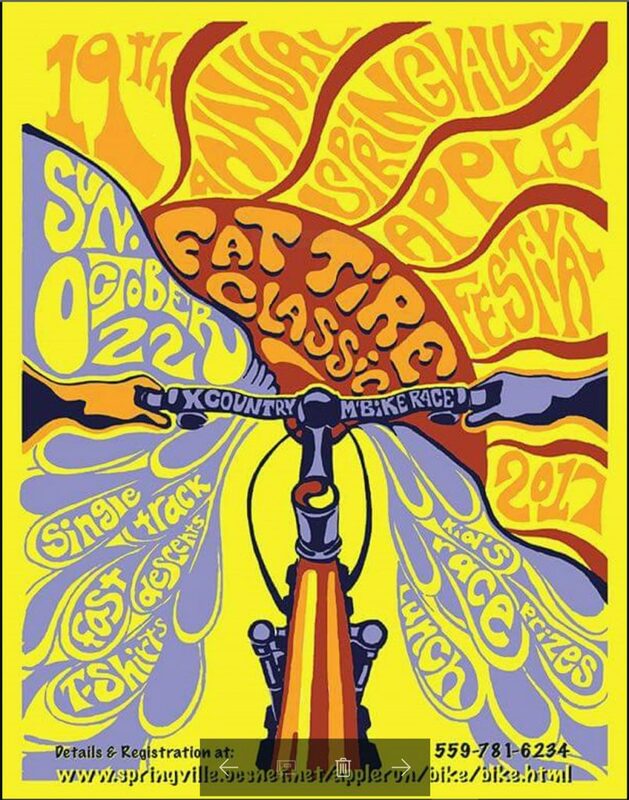 Beck Henry introduced the Fat Tire Classic to the Apple Festival in 1999 and it has become the featured event on Sundays with hundreds of participants. The course is a closed 8-mile loop through the scenic Sequoia Ranch Estates paralleling the Tule River. There are challenging climbs and “spectacular descents” says Beck. The race recognizes a number of categories from Expert-Sport to Beginner with bikes of all stripes including what Beck calls “Clydesdales”.